…is that most Western politicians don’t get it. It’s seen as something relevant to Pre-Modern ‘primitive’ communities but not to Modern societies. And, when Western-style one person/one (secret) vote Democracy is offered to tribal communities as part of the Modernisation process, so many Western leaders seem genuinely perplexed at the relative lack of enthusiasm for it. The Americans in particular seemed baffled that attempts to embed Democracy in the wake of their invasions of the Noughties produced the markedly-corrupt government of Hamid Karzai in Afghanistan and the corrupt and overtly-sectarian government of Nouri al-Maliki in Iraq. A Do-It-Yourself attempt to introduce Democracy in Egypt produced a government (of the Islamic Brotherhood) so unacceptable to the urban middle classes and the army that a ‘sort-of coup’ was instigated, followed by rigged elections, to return the country to neo-military rule as before. Highly-controversial and bitterly-contested ‘democratic’ elections following Libya’s revolutionary civil war resulted in 2 – and arguably 3? – would-be governments claiming the right to rule with their various militia, often organised on sectarian or tribal lines, slugging it out in a patchy, second civil war. Anyone versed in the Gravesian approach could have told the Western planners and the internet-inspired urban ‘democrats’ of Egypt that their campaigns to introduce Western-style Democracy would hit trouble. (See: Well, are the Arabs ready for Democracy? for a ‘real time’ (2011) commentary on this.) The PURPLE vMEME, which produces tribalism, doesn’t work that way. Its drive is to find safety-in-belonging. Thus, the tribe to which it belongs becomes everything…and, in turn, to keep the tribe safe – the PURPLE collective – the individual will, if necessary, sacrifice themselves for the wellbeing/safety/etc of the tribe so that others in the tribe can be safe – the tribe can be safe and continue. The structure of the tribe, its decision-making hierarchies, its ascription of gender roles and its traditions are what is important…and, when nodal PURPLE is dominant, there is no questioning of these norms. The wider world beyond the tribe is of importance only as it affects the tribe. Thus, there is no need for the individual to concern themselves reading the manifestos of the political parties – if they can read, as PURPLE-oriented societies tend to favour oral communication and see little point in the written word. Individuals don’t need to weigh up the pros and cons and make a considered choice as to how to vote. They simply vote as the elders of the tribe tell them. The elders make decisions in the interests of the tribe – not the wider world beyond the tribe. So national interests don’t figure in PURPLE tribal decisions unless what is at stake nationally can be anticipated to affect the tribe. then PURPLE tribal decisions will be for the best interests of the tribe rather than the country. Thus, Western-style Democracy is not appropriate yet for countries like Afghanistan and Iraq. Following the principles of Stratified Democracy and using 4Q/8L, forms of representative government (Lower Right) need to be found which reflect the culture (Lower Left) of the people to be governed. The Loya Jirga, a council of tribal elders, going back in tradition hundreds of years, was a far more appropriate and successful form of government for Afghanistan than the American-imposed Democracy. To be safe in ‘our tribe’, you need to know who is ‘not of our tribe’. Language, religion, political affiliation, geographical source, clothing and, of course, race are all markers to tell the difference. As Henri Tajfel & John Turner’s (1979) Social Identity Theory shows, simply categorising people into those-in-my-tribe and those-not-in-my-tribe creates an in-group/out-group effect which can lead to acting out discrimination. Thus, prejudice and discrimination are not abnormal for PURPLE. In this context, how ever unpalatable to GREEN thinking, discrimination against ‘others’, including displays of racism, is not only not abnormal but can be argued to be adaptive and even normal There is even a biological concomitant in increased amygdala activity when exposed to people of other tribes. As discussed in Is Racism Natural…?, such discrimination can be minimised, with amygdala activity reduced, through gaining familiarity with those not-of-our-tribe and realising they are not a threat. However, identification with those to whom you perceive you belong will usually trump any other considerations when PURPLE is influencing the selfplex and, thus, the values you hold as important. PURPLE almost always discriminates in favour of its own. Time and time again in history, PURPLE discriminations have been a key part of tribal wars. For example, in post-colonial sub-Saharan Africa we have seen tribal loyalties effortlessly override loyalties to the nation state. Natural wariness between tribes has been exacerbated by imposed colonial boundaries which carved up tribal territories, leaving the tribes split and mixed up. For example, part of Tribe A in one state co-exists with part of Tribe B but another part of Tribe A is in another state with part of Tribe C. Parts of Tribes B and C co-exist in a third state. When Tribe A gets into conflict with Tribe B in the first state, Tribe A in the second state are easily riled into wanting to join in. Probably the worst most recent example of this complicated tribal warfare was the Rwandan genocide of 1994, an outcome of ongoing intermittent conflict between Tutsis and Hutus straddling both Burundi and Rwanda. It’s not that PURPLE tribalism in and of itself has a predilection for violence. Both Clare W Graves (1978/2005) and William Samuel (1981) assert that tribal thinking is essentially passive and non-aggressive. Don Beck (2003) doesn’t even include PURPLE in the Assimilation-Contrast Effect. However, PURPLE will defend its own – those with whom it has a shared belonging. Physical geography – its land – is also very important to PURPLE. The land is key to its security – providing a place to live and often sustenance (food and water), So PURPLE also defends the land because the land is key to the tribe’s well-being and possibly even its survival – meaning a BEIGE/PURPLE vMEME harmonic will be at work. In their classic study of 30 tribal groups in East Africa, Marilynn Brewer & Donald Campbell (1976) found that the degree of bias and hostility towards other groups was determined by the proximity of the groups being rated. Groups geographically closer were rated less favourably than those further away. Those groups in close proximity with each other would be more likely to be involved in disputes over territory and access to scarce resources such as water and grazing rights. This inter-group competition for critical resources is in keeping with Donald Campbell’s (1965) Realistic Conflict Theory . As Jerry Coursen (2001) noted, decision-making in tribal councils often acts as a life condition with the potential to pull out the emergence of the RED vMEME, with the results that some people in the tribal council assert themselves and are more argumentative than others. This is particularly so if the individuals in whom RED emerges are high in the temperamental dimension of Psychoticism. RED will assert itself into a leadership role and will seek to use the tribe to further its own drive for power. Creating a threatening narrative about the ‘others’ in the out-group(s) that requires strong leadership against them is likely to boost the status of the would-be leader. If Psychoticism is high in the would-be leader, then their actions to minimise opposition in their own ranks and to diminish the ‘others’ are likely to be particularly ruthless. Social identification (Tajfel & Turner) easily makes the members of the tribe susceptible to narratives about how good your tribe (in-group) is and how problematic the ‘others’ are, with each group having what Pierre Bourdieu (1984) termed its own habitus. This, in Integrated SocioPsychology, means the memes of the sub-culture have become embedded as schemas in the members of the group to the point where it is habit for them to think, talk and behave in the norms of the sub-culture. As soon as any RED is present to focus on esteem, social comparison means you have to take action to demonstrate in-group superiority over the out-group(s). Thus, tribal leaders can whip up hatred for the outgroup(s) and encourage the in-group to violence against people who are deemed lesser/inferior beings. When PURPLE is given a BLUE nationalist or religious sheen, then a kind of broader existential mass conflict can arise, such as the Sunni vs Shia wars which have convulsed much of the Middle East in recent years. The core of the tribe, though, is its constituent families who provide primary socialisation to inculcate their children into the ways of the tribe and thus perpetuate the habitus. Evolutionary Psychology can provide us with the underpinning driver for the BEIGE/PURPLE vMEME harmonic which leads people to sacrifice themselves for members of their family: kin selection. Thus, the more genes you share with someone, the more important it is that they survive so they can pass on the genes you share in common with them. The graphic left shows the strength of the PURPLE sacrifice-self-to-belong effect in terms of genetic relatedness. The closer someone is to you genetically, the more they are likely to be important to you and the more you are likely to sacrifice yourself for them, if necessary. A key study which supports this is a survey by Carl Fellner & Richard Sorrentino (1981). They found that 86% of their respondents would be a kidney donor for their children, 67% for their parents and 50% for their siblings. 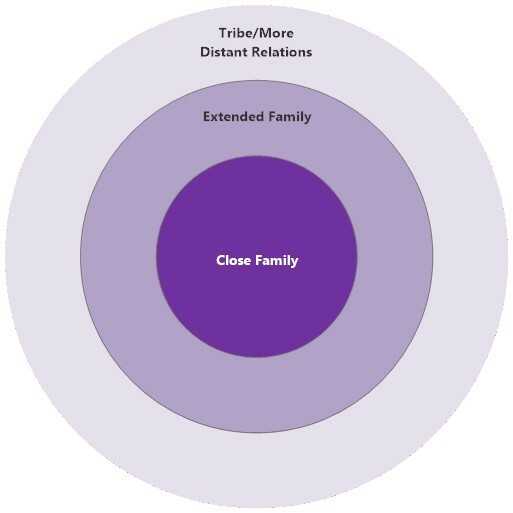 In this viewpoint, there is a complex dynamic between the tribe and its constituent families. The families need the broader tribe for safety and thus submit to the authority of the tribal elders/leaders. Yet in terms of belongingness, the greater loyalty is to the close family first and then to the extended family. PURPLE’S drive to maintain the integrity of the tribe and its constituent families can create some major values conflicts when it comes up against Modernity. While incestuous relationships between 1st degree relatives (sharing 50% the same genes) are almost universally forbidden, cousins (12.5% the same genes) are often permitted to marry in many societies (Abraham Rosman, Paula Rubel & Maxine Weisgrau, 2009). Indeed, in the tradition of the tribe, it may be preferable to keep marriage to within the tribe to avoid contaminating it with ‘impure blood’ – even though such marriages in reality risk a higher rate of congenital birth defects. In 2015 the Daily Telegraph’s Steven Swinford was one of a number of journalists to cover Baroness Shreela Flather’s campaign to get the level of (legal) first cousin marriages amongst Britain’s Pakistani heritage communities reduced, due to the high rate of birth defects from such marriages (30% of all British-born children with a genetic illness). Flather especially highlighted the traditions of people descended from immigrants from the Pakistani Kashmir area for their insistence on traditional first cousin marriages. Unfortunately Flather was talking about DNA and championing the BLUE/ORANGE scientific argument which would have meant little to the PURPLE of those people. For people thinking in BLUE and/or ORANGE, the empirical evidence is clear: the greater the genetic relatedness, the more people shouldn’t have children together – the risks are simply too great. But PURPLE doesn’t think like that; it’s more than likely it doesn’t even comprehend the ‘scientific evidence’. What PURPLE will cling to is its tradition: the tribe has survived and possibly even prospered; so keep on doing what they’ve always done. BLUE and ORANGE simply do not get it. Flather’s campaign is just one example of PURPLE in the Modern Western state. It would be easy to attribute the PURPLE resistance to BLUE/ORANGE rationalism as being due to the immigration of people from a ‘primitive culture’. However, beginning with Desmond Morris (1971; 1978), a number of psychologists and sociologists have increasingly accepted the existence of tribal-type behaviours amongst indigenous white populations in the West as well as among ethnic minority/immigrant communities. In the UK we see PURPLE in the way English and Scots categorise themselves according to tribal identity and then discriminate against each other. Similarly, northerners against southerners, Lancastrians against Yorkshire people, whites vs blacks vs Asians (of course! ), Britons vs Germans, Britons vs French, etc, etc. One of the most perfect applications of Social Identity Theory is in men vs women (social categorisation): each in-group does its own tribal stereotyping of the out-group (social identification) – eg: “Women are so bitchy!”, “Men are only after one thing!” – and then all too often social comparison takes place with one partner trying to control the other and both partners moaning to their in-group friends about their partner’s failings. While it’s a huge generalisation – and, therefore, some care is needed with it – PURPLE tends to dominate more culturally amongst the working class than the middle class. The reasons for this lie in recent social history. Briefly (and undoubtedly oversimply! ), the work the middle classes were required to do and the education they were given (the life conditions) acted as ‘pacers’ (Jane Loevinger, 1976) to draw out the higher and more complex vMEMES. The routine, repetitive and unthinking work the working classes were mostly required to do required little more complex thinking than PURPLE. That some of this work was dangerous promoted the need to find safety in belonging – eg: fishermen at sea or miners down a pit are highly dependent on each other – that dependency usually promoting good relationships and an enhanced sense of common identity. “When I first entered the workplace in the early 1970s, a middle class boy from a fairly-protected environment, with my late-hippie-era GREEN values of equality and tolerance, what used to pass as the manual working class was a real shock to me. I found it hard to equate the racism and sexism I found to be pretty much the norm with the values preached by the Labour Party that claimed to represent them. Years later, through my training in the Gravesian approach, I came to see that traditionally there were 2 distinct strands running through Labour’s politics. One was the GREEN of the intellectuals – students, lawyers, teachers, etc – who colonised much of the Labour leadership. The other was the PURPLE of the tribes – working class communities and shopfloor unions – and their leaders. These were often working class people whose self-expressive RED had driven them to become union stewards and local ward councillors. Not all politicians are clueless, though, when it comes to speaking to PURPLE’S values. Donald Trump in the US, Nigel Farage and Boris Johnson in the UK and Marine Le Pen in France have grown their power bases enormously by exploiting PURPLE’s fears of other tribes. In each case mentioned, it has been an ethnic majority in not-unnatural fear of immigrants that has been worked up by RED-driven demagoguery. It’s not that dissimilar from the PURPLE/RED forces that have led so often to tribal war and atrocities in sub-Saharan Africa. In the case of the recent British referendum on continuing membership of the European Union, BLUE/ORANGE arguments put forward about economics, trade, currency fluctuations and investment largely passed the PURPLE tribalism of the white working class by. Talk of jobs and employment made some impact; but it was immigration and the meme that Britain could somehow be saved from the ‘others’ – the immigrants – that is generally reckoned to have driven many of the 52% who voted to leave the EU. See the Blog post: So the Turkeys did vote for Christmas?!? PURPLE operates on what in the 2003 Blog Does Hull have a Race Relations Problem? I referred to as a ‘village gossip mentality’. Official facts and figures – produced by BLUE and ORANGE – mean little but the person I reified in that post as ‘George’, “accepted within the local community as a leader or influencer – tribal elder…” is listened to and what they say matters far more. Trump, Farage, Johnson and Le Pen, for all the obvious wealth that in reality sets them apart, have positioned themselves as the voice of ‘ordinary decent people’, saying things the ORANGE/GREEN-oriented elites in Capitol Hill, Westminster and the Palais Bourbon don’t want to hear and/or can’t understand. They are ‘super-Georges’. As discussed in the forthcoming Blog post Wither the EU..?, the Westminster elites don’t know what to do about the 52% Leave vote in the UK’s EU referendum and the Palais Bourbon elites worry about Le Pen’s demands which get greater in proportion to her rising popularity. Meanwhile, the Capitol Hill elites shake their heads in horror – even the Republicans! – at the very real prospect of ‘President Trump’. For all that the Western nations tend to characterise themselves as Modern. sophisticated, cultured and complex, PURPLE tribalism has been used to tear apart Yugoslavia and the Ukraine; it is being used to push for the Basque and Catalan regions of Spain and the French-speaking area of Canada to be independent; and in Northern Ireland the truce between the tribes is unsteady. And it is far more a truce than a reconciliation in Northern Ireland – how ever much people don’t want a return of the violence of The Troubles. 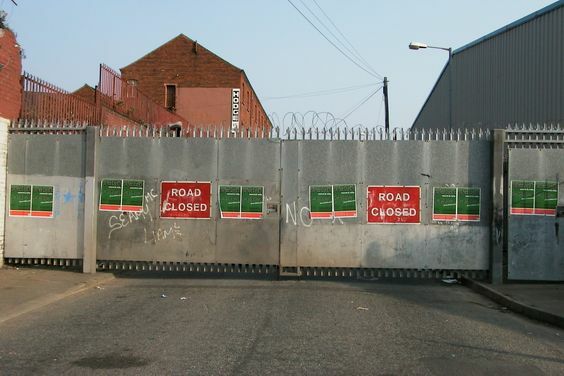 There is little integration of the communities and the so-called ‘peace walls’ that separate Protestant Unionists and Catholic Republicans still stand 18 years after the Good Friday Agreement. From the potential for civil war to the failure of social policies like back-to-work schemes, mainstream Western politicians get caught out by PURPLE tribalism again and again because they are not working with those values. To reference Robert Dilt’s Neurological Levels model, what people want to learn (Skills & Knowledge) and the way they behave (Behaviour level) comes from how people see themselves (Identity level) and what they think is important (Values & Beliefs level). To get people to think and behave differently, you have to work at the levels of Identity and Values & Beliefs. Mainstream politicians tend to castigate people for voting UKIP or boosting Trump in the polls but the fact is that Farage and Trump articulate PURPLE tribal values while the elites try to impose their ORANGE and GREEN values upon them – usually without much success. To reconnect and rebuild trust between voters and the political establishments, politicians have to learn to manage tribal values – to work with people where they’re at rather than where they politicians think they should be at. It’s a Maslowian principle enshrined in the Gravesian approach and its Spiral Dyanamics and Spiral Dynamics integral builds that lower less complex needs have to be met before more complex vMEMES can emerge – see: The Process of Change. Of course, that doesn’t mean PURPLE values should dominate society. All the different vMEMES’ needs should be met – which requires the kind of balancing act only 2nd Tier thinking is capable of. needs to be addressed & moved forward. Really Interesting! A few initial comments: As you point out PURPLE tribal thinking revolves around family, kinship and clan. These survival loyalties emerge out of BEIGE survival challenges and are based on pre-operational (or early con-op), magical thinking. As such it seems logical that these groups are limited in size as these primitive modes of thinking can only really handle the immediately present. The groupings of interest in discussing BREXIT are far wider. They are national and ethno-centric identities based on shared culture and value. These seem to me to be firmly BLUE traditional structures as they depend on a more sophisticated early form-op cognition where identity revolves around imaginative and projected commonality far beyond blood ties of family and kin. I therefore question your assertion that BREXIT has been driven by a resurgent PURPLE and more the anguished cry of a decaying BLUE. Adding weight to the above is also that in my opinion the ‘unholy alliance’ that GREEN world-centric multicultural values aligns itself with is not PURPLE (which is too primitive to even recognize higher memes let alone ally with them) but RED. RED’s ego-centric ‘nobody tells me what to do’ chimes well with the GREEN world-centric ‘ to honor all voices with no judgement’. This is pretty obvious when one considers many left wing movements (Stop the War Coalition is a classic example of GREEN/RED alliance). This is the argument of Ken Wilber in his Boomeritis thesis (great book by the way). The great victim of Boomeritis is the BLUE meme. Despised from below by RED and above by GREEN. I have long thought that the current Spiral imperative is to strengthen and rebuild healthy BLUE as the great conventional stage that acts as the conduit between the pre-conventional and the post-conventional. It is for these reasons that with a heavy heart I welcome the Brexit vote. The GREEN liberal elites of politics and media have become virtually immune to more integral voices and the leave vote may, just may, cause a trigger to second tier by making the voice of BLUE impossible to ignore.